After finally making the official announcement for his vice presidential pick on July 15, Donald Trump and Mike Pence interviewed together for the first time and all 20 minutes of awkward conversation were broadcast on CBS's 60 Minutes. I'm not sure if Trump and Pence haven't spent much time together and that's why they bombed the first interview together, but whatever the reason, they didn't seem like a very presidential pair. Trump has been publicly speaking about his political views as a presidential candidate for more than a year, yet somehow he was tense (at times unbearably tense) in this new interview with Lesley Stahl. Although the conversation started with Stahl directly addressing and congratulating Pence on his "huge, life-changing moment," Trump basically dominated the conversation the entire time. Unsurprisingly, he interrupted both Stahl and Pence countless times, and, for the most part, Pence sat on the sidelines and watched (with a smirk and the occasional chuckle, no less!) as Trump tanked his campaign in what was the single most important interview at the moment. The first Trump-Pence interview was comical in many ways, even if it was uncomfortably awkward at times. For example, Trump claimed that after he offered Pence the VP position, "about two seconds later he called me." Two seconds was all it took for Pence to accept this offer, Trump said. Even Pence thought that was funny. Perhaps the most awkward moment came near the beginning of the interview when Stahl pressed them on the subject of war. In classic Trump style, he couldn't really explain how he would accomplish things (like beating ISIS) or what he really stands for; instead, he repeated himself ("It is war. By the way, it is war," and a few incarnations of "We have to wipe out ISIS") and danced around the questions. At one point, Pence tried to jump in and save the day by saying, "This is... this is the kind... this is the kind of leadership that America needs," but even that was a weak statement. And he was referencing Trump after he had just witnessed him failing to stay afloat when talking about his plan for declaring a war on ISIS — you know, an issue that Trump should probably have down by now given his explicit feelings about the terrorist group. 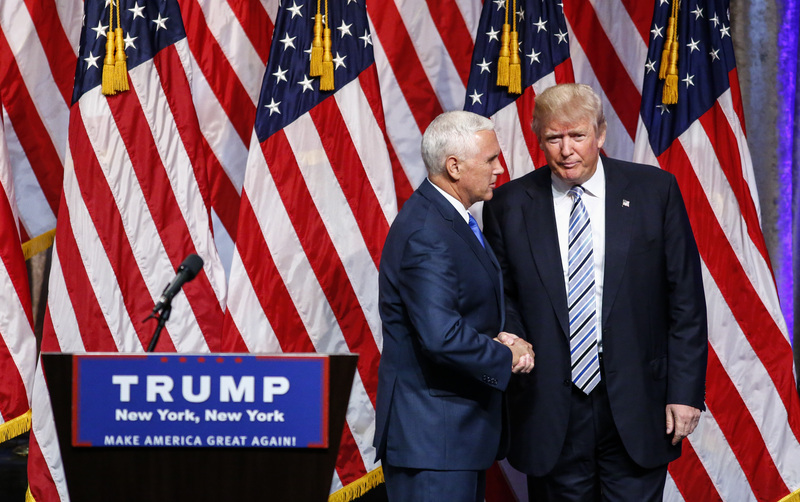 Following in line with this uncomfortable conversation as everyone watching could see the collective downfall of the Trump-Pence ticket, Trump made it clear that he and Pence are held to different, easier standards than Hillary Clinton. Pence previously voted in favor of the Iraq war, which Trump has been staunchly against since the beginning of time, and he has used Clinton's support of the Iraq war against her in every possible situation. However, Trump made it clear in this 60 Minutes interview that he quite literally doesn't care that his running mate voted in favor of the same thing Clinton voted in favor of and that he criticizes her for ad nauseam. There are moments throughout the interview when Pence literally sits chuckling to himself or stares intently at Trump, as if he's focusing on and agreeing with him, but is probably regretting accepting this VP position already.